Ah, Scourge. Born from Thundercracker’s remains in the 1986 Movie, Scourge went through the next hour-ish of movie with only one line, which you can see above. The character remained as a mainstay throughout Season 3 of the G1 cartoon and had some memorable episodes. I especially like ‘Ghost In The Machine’ where Scourge was possessed by Starscream’s Ghost. As the Classics and Universe toy lines progressed, it was only a matter of time for a Scourge release after Galvatron and Cyclonus made their ways to stores. Scourge had to wait for the Generations line to get a new toy, but it was well worth the wait. 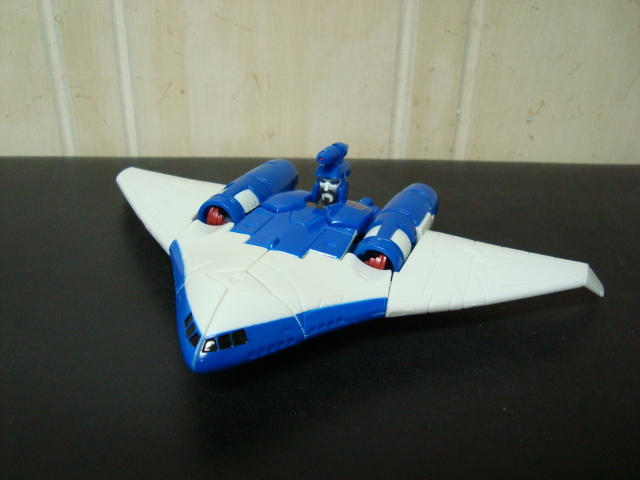 Scourge transforms into a jet designed to resemble a Boeing X-48 instead of his ‘flying boat’ type thing (technically it's a Cybertronic Hovercraft, but it looks like a boat to me) he was in G1. 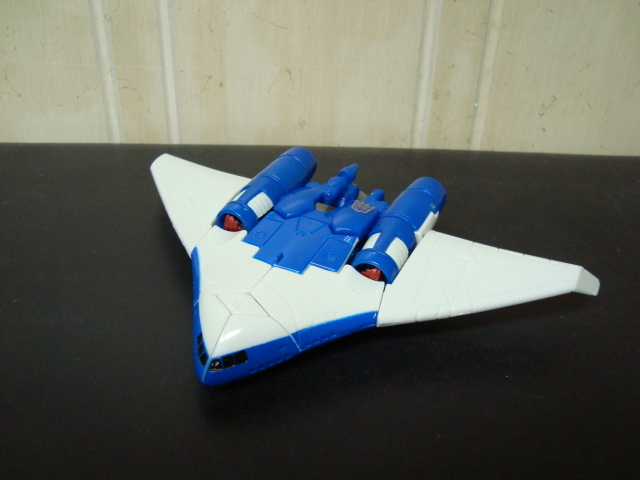 The alternate mode is very solid and has a white and blue color scheme that is very vibrant. The underside of the alt mode has small flip-down landing gear that is molded in gray plastic, though the wheels don’t spin. Granted, if the wheels did spin, the landing gear would end up ridiculously large and I think it would detract greatly from the compact design. The engines are nice looking as well and seem appropriately sized for this figure. The downside is you can see his hands on one end, though at the same time they just look like engine vents. Overall this is a great update and far superior to a flying space boat. This mode also has some neat features: 1) Scourge’s weaponry is tucked into the wings upon transformation so there aren’t any obvious clipped on blasters, and furthermore it’s more difficult to lose them when they’re packed away. 2) Scourge’s head can move up in alternate mode to give him that tracker ability, as well as to see better than he apparently could out of the cockpit. These are a couple small but good additions to an otherwise average alternate mode. Scourge’s robot mode is equally as good as his alternate mode, if not better. After a complex but fun transformation, Scourge is a great representation of his G1 namesake. The transformation back and forth is quite fun, and robot bits tuck nicely in and are hidden well when in jet mode. I think my favorite part of the transformation is the arms/engines. There is quite a bit of twisting but it's really intuitive and easy to pull off. Anyways, this figure has been fantastically updated with good articulation (pivot joints on the shoulders, elbows, knees, and ankles, twist joints on the wrists, and ball joints on the hips and head). All this articulation allows him to get into some decent positioning, and his feet are large enough to accommodate most positions. However, the wings on his back are rather large and can add some balance issues. Speaking of the wings, they’re a great homage to the figure of old, however they can be a tad finicky and can flop around a bit. A couple more tabs here and there would have made it a little snugger than it is. You can also fold Scourge's wings out to give him a more traditional G1 look, though I prefer to leave the wings snapped together. That's just an aesthetic preference though, he works quite well both ways. Paint and molding details are nicely done and streamlined. 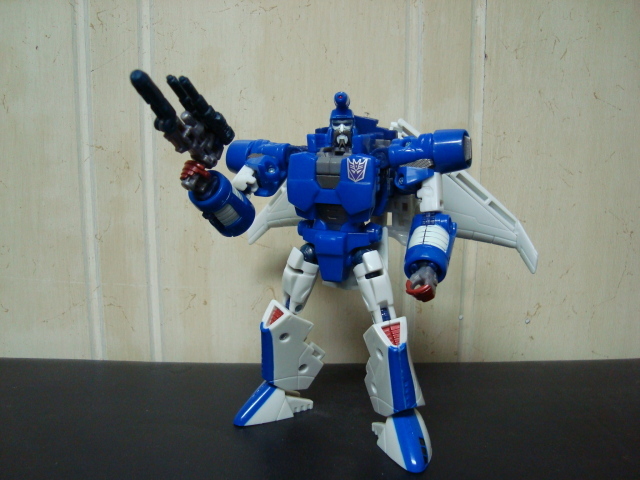 Scourge’s main coloration is white and blue, but some gray paint apps appear on the torso along with a Decepticon symbol that was formerly on the top of the jet mode. Gray paint apps are also used on the shoulders and hands and his fingertips are painted red! The hands have standard 5 mm peg holes which can hold his blaster/pistols (more on that in a bit). The head mold I would say is phenomenal. Scourge has several trademark things going for his head like the red telescope-thing on top, the fu-man-chu moustache and the popped-collar look by his neck. The paint on his face is done well; white for the majority, the moustache is dark grey, and light blue light piping make his head a complete package. The major downside to his head is the eyes. While the light piping works just fine, they should be red. NOT BLUE. What Decepticons have ever had blue eyes, especially a high profile character like Scourge? That just doesn't make sense. But I guess Classics Megatron got green eyes, so we might as well keep the trend of random things going wrong in these figures. For accessories, Scourge comes with a blaster that nods back to his good ole days as a Targetmaster, which coincidentally looks quite like Fracas. 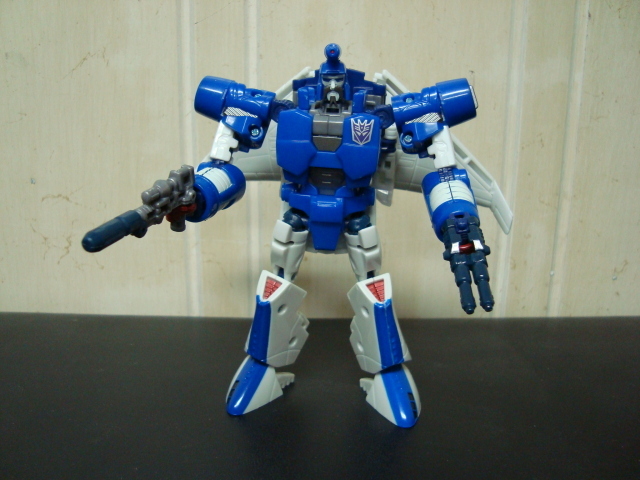 Unfortunately his blaster doesn’t transform into a robot like Universe Cyclonus’ Nightstick, but it does have the ability to disassemble into two pistols to dual weapon wielding. This adds for a bit of fun with Scourge, and the dual wielding allows for some gunslinger poses. Plus he’s got that awesome mustache to complete the cowboy look! All of this basically boils down to Scourge being a fantastic toy with an easy and fun transformation, two great modes and a little added fun with the blaster/pistols, and the ability to pop his head up in jet mode. This is purely a well done figure. Transformation Design: 8. Simple, intuitive, and fun. Some things snap out of place during movement but are easily fixed, and weapon storage in the wings is a great bonus. Everything, except for the wing backpack in robot mode, snaps snugly together. Durability: 9. Scourge is solid all around. Anything that can fall off can be easily reattached. Fun: 9. Two great modes, a phenomenal weapon, and a few extras make Scourge a fun Transformer to fiddle with. Aesthetics: 9. Scourge has a great updated look, a great color scheme, and everything is in good proportions. A great display piece! Articulation: 8. He's not the king of articulation points, but what he has works well for the figure. Wide feet and plenty of joints make him easy to pose. Value/Price: 10. He’s not too expensive if you can find him at retail and he’s got a lot of fun packed in there to boot. This is a great package at a decent price. Overall: 9. Scourge is absolutely solid in many categories. I put him right up there with Universe Cyclonus as far as quality and fun are concerned, and he’s light-years ahead of Universe Galvatron. Scourge is truly a worthy addition to your collection, and he looks great next to Galvy and Cyclonus.